Geography Cat’s humans recently visited the Cotswold Wildlife Park and sent him this card. 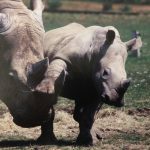 The picture shows a mother and baby white rhino, these important animals are hunted by poachers in their habitat, particularly in South Africa. Find out what can be done to save them from extinction by visiting the World Wildlife Fund.